Hahnemann first used a homeopathic potency of Belladonna, selected using the Law of Similars, to prevent Scarlet Fever in 1798. Since then homeopathic immunisation, or homeoprophylaxis, has been used by tens of thousands of homoeopaths. Results have been described in our literature, but there has been relatively little formal statistical analysis of results. Further, most interventions have been by individual practitioners with relatively few people. This paper provides a graphical description of the use of homeoprophylaxis by a government’s medical institute to protect literally millions of people. This experience has the potential to change the way homeoprophylaxis is viewed by parents, practitioners and governments around the world. The use of homeoprophylaxis (HP), or homeopathic immunisation, has been debated in this journal. Some homoeopaths oppose it on philosophical grounds (see the debate between Professor Vithoulkas and Dr Golden), some on more technical/political grounds (see the views of Dr Fisher which have been contested by Dr Golden). However HP has considerable support internationally being, as it is, part of Hahnemann’s “classical” method based squarely on the Law of Similars, and first used by him in 1798. Irrespective of conceptual issues, the principal question is whether HP is effective and safe. Both aspects have been thoroughly researched and the evidence published. The question of safety is relatively easy given the absence of toxic materials in potentised remedies; however the question of effectiveness and efficacy remains hotly contested by orthodox scientists. They say that homeopathy in general is “implausible” because “nothing is there” and therefore both treatment and prevention cannot work irrespective of the evidence. Whilst this is a very unscientific response, it remains the responsibility of advocates of HP to show convincing evidence that it does work. The historical use of HP from Hahnemann in 1798 to the present day, widely evidenced throughout the homeopathic literature, and used by many “masters” of homeopathy. Short-term use of HP in epidemic situations. One of the most thorough of such studies has been by Morinski and colleagues in 1998. A review of such research points to an effectiveness of around 90%. Long-term use of HP in non-epidemic situations. Golden showed an effectiveness of 90.4% in his research from 1986 to 2004. The massive and highly successful HP interventions in Cuba involving millions of people from 2007 to 2010. It is this latter piece of evidence that we will now examine further. 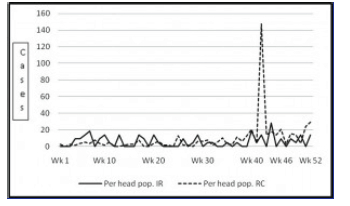 Figure 2 shows the Incidence of the disease in 2007, and the impact of the two-dose HP program which was conducted in Week 45. Once again a weighted per head of population figure is shown, which illustrates the impact of the intervention even more clearly. 2007 was already a worse than average year for residents of IR, and became dramatically so following the hurricanes. 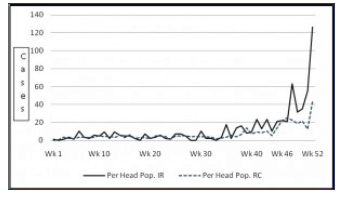 However the outbreak “broke” in IR in Week 47, 2 weeks following the HP intervention, although it continued in RC where there was no intervention. A second two-dose round of HP was administered in 2008 to the residents of IR, this time using a higher potency of the remedy (200C in 2007, 10,000C in 2008 – 2 doses a week apart). 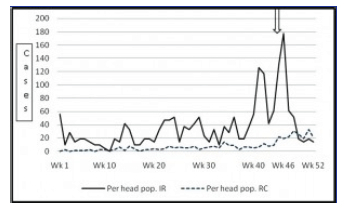 Figure 3 shows that the disease remained contained in IR (once again, the most at risk region), but continued as expected in RC apart from a significant single incident in Week 42. The impact of the HP intervention is clear from the above Figures, but was also demonstrated when comparing the actual progression of the disease in IR in 2007 with the expected number of cases derived using a predictive model based on rainfall experience over time, plus other factors. Figure 4 has been reproduced in other studies of the intervention,,. One issue regarding this diagram was the reliability of the predictive model used. Further examination revealed that the model used was quite reliable in IR, but less so in RC. One final examination of the leptospirosis data from 2004 to 2008 is presented in Figure 5, showing the incidence of the disease for both regions. It shows clearly the seasonal peaks and troughs over the years, with a breaking of the seasonal trend in IR in late 2007, and the substantial reduction of the disease in IR in 2008 despite IR remaining the region most at risk due to severe hurricanes in IR in 2008. 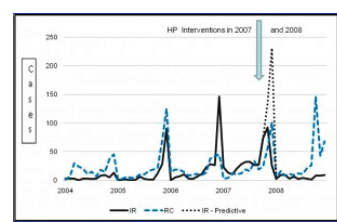 It also shows the 2007 prediction for IR shown in Figure 4 (without the HP intervention factored in), but this time shown in monthly figures rather than weekly as in Figure 4. 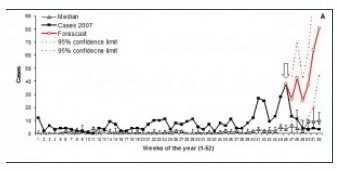 At this time a predictive trend for 2008 excluding the influence of the HP interventions is not available, but it certainly would show a higher incidence of the disease than that which occurred in RC. However the data which is available clearly shows the positive impact of the interventions. The HP intervention against leptospirosis in IR in 2007 and 2008 has been an unqualified success. The details of the effective intervention were mentioned in the Cuban Assembly. Following on this experience a decision was made to undertake a massive HP immunisation of the total population against Swine Flu in 2009/10 involving over 9.8 million people. The results of this intervention will not be known until 2011 when data can be assembled and analysed. It is clear that the Cuban initiative in safe, effective, and low cost infectious disease prevention, making the Cubans world leaders in this area of immunisation, will be followed with great interest by both practitioners and public health scientists around the world. i. George Vithoulkas and Isaac Golden, in http://www.hpathy.com, April – September, 2007.
ii. As evidenced in the debate between Dr Fisher and Ben Goldacre. Natural History Museum. iii. Golden I. A Respectful Challenge to Dr Peter Fisher Regarding Vaccination. J. Hom Med Assn. May, 2009.
iv. Hahnemann S. The Cure and Prevention of Scarlet Fever. Lesser Writings. B.Jain Publishers. v. Golden I Vaccination & Homeoprophylaxis? A Review of Risks and Alternatives. 7th edition 2010. Isaac Golden Publications, Cherokee, Victoria, Australia. vi. For a summary of some major references see Golden I, Homeoprophylaxis, A Practical and Philosophical Review. Isaac Golden Publications, Cherokee, Victoria, Australia. vii. Mroninski C, Adriano E, Mattos G. Meningococcinum: Its protective effect against meningococcal disease. Homoeopathic Links Winter, 2001. Vol 14(4); pp. 230-4.
viii.Golden I. Homeoprophylaxis: A Fifteen year Clinical Study. Isaac Golden Publications, Cherokee, Victoria, Australia. 2004.
ix. Campa C, Bracho G, Cruz R, Menendez J, Martinez R, Gilling E, Wella R. Homeoprophylaxis: Cuban Experiences on Leptospirosis. Nosodes 2008, International Meeting on Homeoprophylaxis, Homeopathic Immunisation and Nosodes Against Epidemics. Havana, Cuba. 10-12h December, 2008.
x. Bracho G, Varela E, Fernández R, Ordaz B, Marzoa N, Menéndez J, García L, Gilling E, Leyva R,Rufín R, de la Torre R, Solis R, Batista N, Borrero R ,Campa C. Massive Application of Highly Diluted Bacteria as Homeoprophylactic Formulation for Leptospirosis Epidemic Control. Homeopathy. 2010. 99, 156-166.
xi. Golden I, Bracho G. The Homoeopathic Prevention of Leptospirosis in Cuba. J.Am. Institute of Homeopathy. Summer. 2010. 10 books on homoeopathy and many articles in Australia and internationally. Dr Gustavo Bracho is Advisor to the President and General Director of Finlay Institute, Havana, Cuba, and head of the Homeopathy and Biotherapic Projects at the Institute. He is an experienced researcher in molecular and cellular biology, and has headed the Adjuvant Group within the Immunology Department of Finlay. In 2005-2006 he was a researcher in a Collaboration Project with the Flinders Medical Centre, Adelaide, Australia, examining vaccine production methods. He has pioneered the use of homeoprophylaxis in Cuba as both an adjunct to or an alternative for orthodox vaccination. He is widely published in his area.